Oxford Bus Company’s PickMeUp service, a demand responsive ride-sharing service, has been listed for three awards. Launched in June of 2018, the service was one of the first of its kind, and enables passengers to request a mini-bus pick-up within 15 minutes at a virtual bus stop using a mobile phone app. Passengers are then matched with others desiring a similar journey. smart approaches to advance transport in their cities. In addition to this, it has also been shortlisted in the annual European Transport Ticketing Global Awards in the Most Innovative Customer Serving Operator category, which rewards organisations who have created successful smart ticketing programmes across Europe. PickMeUp has also been longlisted by charity Ashden, in the Air Quality Within Cities category for the global annual Ashden Awards, which recognise sustainable energy pioneers inside and outside of the UK, leading the way on supporting a low carbon future. 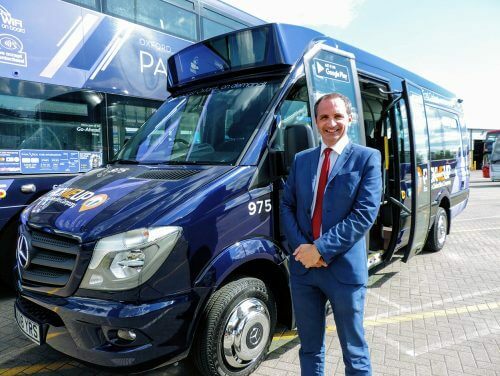 Phil Southall, Oxford Bus Company Managing Director, said: “The response to PickMeUp has been phenomenal, not just in terms of the public embracing the service in ever increasing numbers, but also from industry. “We have been contacted by numerous operators who are interested in introducing the service and technology elsewhere.